Why Should You Learn Angular 7? 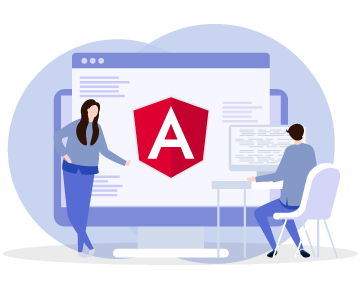 Backed by Google, Angular is widely popular for creating dynamic apps and its data binding and dependency injection features significantly reduce the amount of code that needs to be written. It is being used extensively by developers for building web, desktop, and mobile applications. This has led to a significant rise in the number of opportunities for professionals who are trained in Angular 7. How do you get started with Angular 7? By the end of this workshop you will become familiar with the fundamentals of this language and learn to build SPA applications that will help your business achieve faster ROI due to lesser development and maintenance cost, and faster accessibility. Learning Objectives: This module gives you an overview of what you will learn in this course. Learning Objectives: - Here you will learn about Single Page Application vs Multi Page Application, and the pros and cons of SPA vs MPA. Understand the developer experience delivered by angular tooling, and get a high level overview of the framework and its community. Learning Objectives: - Learn about Angular history and the notable improvements on every version. Hands-on: Create variables using let and const, create multi line strings with template literals, use spread and rest operators with functions, pull values for arrays and objects using destructuring. Learning Objectives: Upon completion of this module you will gain insights into the typesystem of typescript. Hands-on: Create variable with different TS supported data types. Learning Objectives: Upon completion of this module you will gain insight about how to use functions and how to take advantage of strict typing in function definition and invocation. You will also learn the functional style influenced arrow function along with pros and cons. Finally understand the typescripts way of achieving functional overloading. Hands-on: Create functions with mandatory, optional and default parameters. Create arrow functions. Learning Objectives: Upon completion of this module you will understand object oriented style of developing applications using typescript classes and also experience the power of encapsulation with typescript access modifiers and other important features of typescript classes. Hands-on: Create classes with properties, methods and accessors. Implement inheritance. Hands-on: Create interface and use it to validate object shapes. Implement interfaces on classes. Hands-on: Create modules and import them into other modules. Learning Objectives: Upon completion of this module you will learn aspect oriented programming pattern with the help of decorator. Learning Objectives: Upon completion of this module you will know how to setup angular CLI and create a new project is command line tool. You will also gain insight about the project structure and the significance of project files. Also experience the debugging of your angular app in visual studio code and learn how to view runtime information with augury chrome extension. Hands-on: Create a new angular CLI project using angular CLI, execute and debug. Learning Objectives: Upon completion of this module you will get a bird’s eye view of angular and its programmable members. This module lays the foundation for the entire course. Learning Objectives: Upon completion of this module, you will understand the significance of angular module system. You will also gain an insight on why modules are needed, how do we create modules and different kinds of modules. Hands-on: Create feature module and import feature module into root module. Learning Objectives: Upon completion of this module you will know the significance of components, how to create a component with different ways of attaching templates and styles. Hands-on: Create component with inline and external template and styles, create component manually and with cli, also apply component composition by using a component in another component. Learning Objectives: Upon completion of this module you will understand the angular templating syntax and explore the powerful data binding features. Hands-on: Use different data binding syntaxes in template. Create template reference variables and use them in template. Learning Objectives : Upon completion of this module you will experience the power of angular directives and the different kinds of directives supported in angular. Hands-on: Implement iteration and conditional rendering in template using structural directives and implement dynamic styling with attribute directives. Learning Objectives : Upon completion of this module you will understand angular data transformation capabilities using pipes. Hands-on: Use currency, date, json and other pipes to transform data. Apply some the built in pipes in transforming data in class room course project. Learning Objectives : Upon completion of this module you will learn how to develop forms in template driven and reactive form styles along with form validation techniques. Hands-on: Develop forms in both template and reactive forms along with validation. Also you will code form with most commonly used controls like textbox, drop down lists, checkboxes, radio buttons, buttons. Learning Objectives : Upon completion of this module you will understand the significance of dependency injection in angular and the different kinds of provider types in angular. Hands-on: Develop services and provide them as dependencies for components. Provide component at self, parent and root levels.Create 3 different types of providers. Learning Objectives : Upon completion of this module you will learn how to implement navigation in angular, you will also learn how to protect route with route guards. Hands-on: Develop navbar component that provides routing for application. Use route configuration at root module and feature module level, also protect routes with guards. Hands-on: Create and use observables and operators. Learning Objectives : On completion of this module you will learn how to consume remote api using http client. Also understand the power of interceptors for better error handling. Hands-on: Create a service that uses HTTPClient to make CRUD operations. Learning Objectives : On completion of this module you will gain an insight about the new features offered in angular version 6. Hands-on: Create angular element and see how it can be used out on angular application. Learning Objectives : Upon completion of this module you will understand how to write unit test cases to test component, services and pipe. Hands-on: Unit test a component, service and custom pipe. Hands-on: Demonstrate how to run AOT, build and deploy code on simple HTTP server. - a mini project like Wikipedia but limited to book details. This Angular 6 course has covered valuable amount of ground in the specified time. Trainers are highly experienced, knowledgeable and possess high exposure. An incredible course for both freshers and experienced people looking to build a career in developing full-stack Single Page Applications with Angular. The course taught us the Angular basics as well as advanced topics like ES6 and TypeScript language features. I joined this course as a beginner and the trainer took it from beginner to completely expert level by the end of the course. Their practical teaching approach helped me gain practical experience required to build a real-world SPA from Scratch. I am a web developer passionate about building, managing and deploying scalable web applications. But, I am facing issues while dealing with real-world projects. So, decided to take a course and joined Zeolearn for the advanced Angular 6 course. Gained strong command on coding with Angularjs by building multiple real-world projects. I am now able to start with real-world projects with ease. Thank you team Zeolearn!! I have no prior knowledge of Angular concepts but I am able to understand everything without any hurdles throughout the course. The projects are engaging and interesting. The course is worth every penny you paid for it. I recommend this course to everyone looking to enhance their Angular skills. What will I learn during the Angular 7 training? What would the objectives of Angular 7 workshop be? The objective of this course is to help you learn the practical aspects of Angular 7 Through our hands on, practical approach, you will get working knowledge of developing Single Page Apps and creating highly responsive and interactive web pages. What are the prerequisites for the Angular 7 course? Do I need to have prior knowledge of HTML and CSS for Angular training? Yes, having any prior knowledge is mandatory. HTML and CSS skill would be required for developing Single Page applications. Who can take up the Angular 7 course? Why should I learn Angular 7? This Angular 7 workshop is a blend of theory and immersive hands-on sessions. During the class, your instructor will hand-hold you through live coding sessions. You will also be required to complete assignments after each module and after the entire course, which need to be coded outside the classroom.You can clear your doubts and get the support needed to gain confidence in your coding abilities. How many projects will I create during the Angular 7 training program? This course is designed and delivered by industry-recognized experts who have years of real-time experience in web development and programming. Not only will they teach you everything from the fundamentals to the advanced concepts in Angular 7 but also provide end-to-end mentorship and hands-on training to help you work on real-world projects. How do I set up the environment for Angular 7? How is Online Interactive training Conducted? This is a live training to which the learners can attend from office, home, or any other suitable place, with a proper internet connection. You will receive a registration link to your e-mail id from our training delivery team. You can dial in (from mobile or landline), register from your mobile application or log in from your PC or other devices. Do I have other participants in the class? How does the 24/7 support work? Zeolearn offers a 100% money back guarantee if the candidates withdraw from Angular Course right after the first session. To learn more about the 100% refund policy, visit our refund page. Yes, we have scholarships available for Students and Veterans. We do provide grants that can vary upto 50% of the Angular Course fees. Usually the installments vary from 2 to 3 but have to be paid before you complete the Angular Certification. Berlin is perhaps the oldest metropolitan and has been the Capital of Germany since the thirteen century. Today Berlin cuts a picture of vibrant nightlife, modern architecture, technological progress and glamor. A multicultural cosmopolitan is one of the major investment capital in Europe and this has opened doors of opportunity for skilled Angular JS developers. The course will help you understand the “Dependency Injection” thoroughly. You will learn about two data binding and how to share data between the controllers. You will also be taught how to create controllers. You will be taught how to organize the application using the modules and how to split the files into various locations. Apart from Students and Web developers, the course will be useful for anybody who is interested in understanding and grasping the fundamentals of the Web application platform. Prerequisite for learning this course?? The Zeolearn online training course is designed to simulate a classroom learning experience. The course is designed and is mentored by the instructors who have on hand industrial expertise on developing web applications. The tricks, tips and several other techniques that are proven and are used by these industry experts will help you have an additional edge over your peers and other aspirants. The Zeolearn’s online training program in Berlin for Angular JS is designed to help you generate a fully functional web application.